Nestled in the Cobequid Mountains near Earltown, Nova Scotia, our trails are part of the Cape to Cape Wilderness Trail system being established between Cape George and Cape Chignecto and, which in turn, will eventually be part of the International Appalachian Trail. The Gully Lake to Nuttby Mountain section currently consists of three independent loops ranging from 6 km to 12 km. and make connections between the Cape to Cape section in Dalhousie Mountain, Pictou County, the Gully Lake Wilderness Area, Caribou Lake Brook, Taylor Lake, Earltown Lake, and Rogart Mountain in West Earltown. Within the Gully Lake Wilderness Area, the two loops and connectors, totaling approximately 25 kilometers, go over undulating open-spaced hardwood hills, and through coniferous woods alongside the Juniper Brook, Gully Lake Brook, Salmon River, White Brook and Caribou Lake Brook. The trail passes by or near at least six waterfalls and provides windows over ecologically sensitive marsh habitats. This hiking trail is a great way to enjoy Gully Lake Wilderness Area's beautiful hardwood and mixed forest hills. 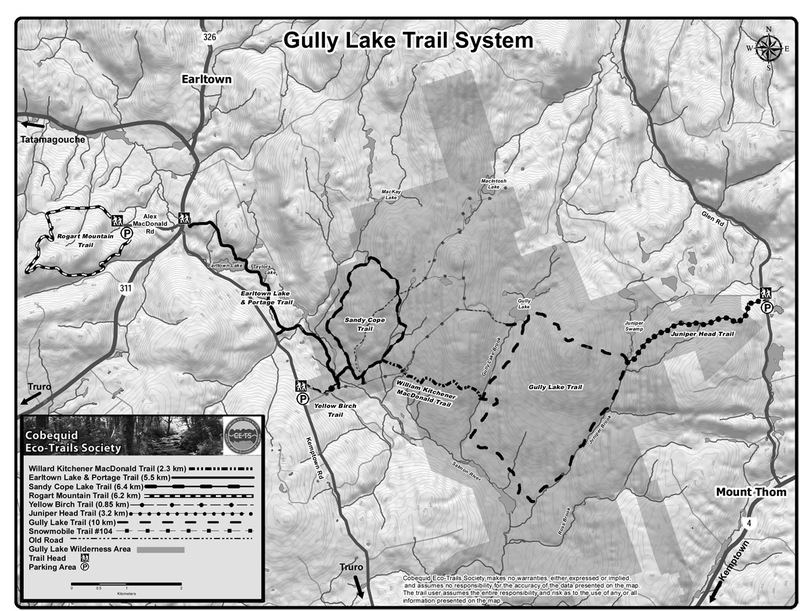 Gully Lake Wilderness Area provides an anchor to the trail system, which provides one of the best wilderness experiences in Nova Scotia. 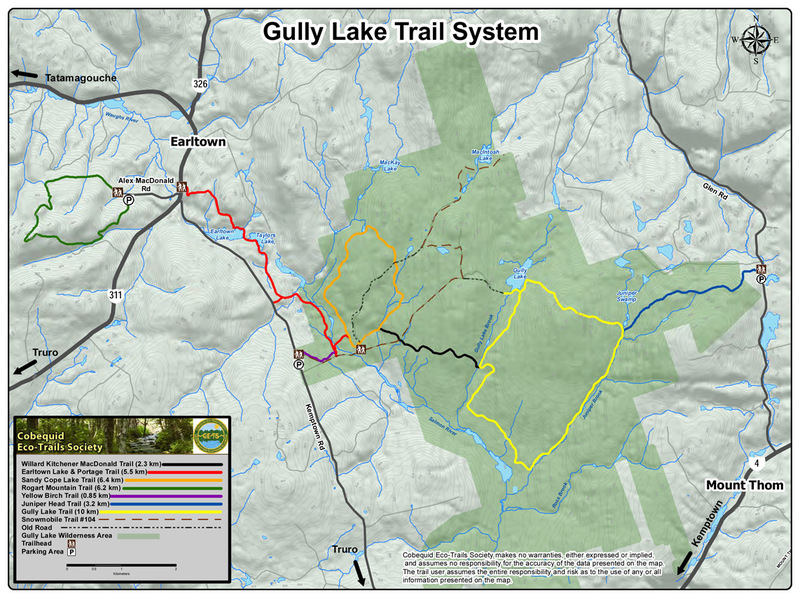 Visit the Nova Scotia Department of Environment's website for more information on Gully Lake Wilderness Area, including answers to commonly asked questions about wilderness areas. Note that these trails are wilderness trails. Appropriate footwear and a reasonable level of fitness are required. Cell phone usage is sporadic at best so be prepared to be self sufficient. Assistance if required could be hours away. Hunting season runs from the last Friday in October to the first Saturday in December. The use of hunter orange clothing is recommended during this period. For more information read our Trail Users’ Checklist. CETS promotes and endorses the use of "Keep It Wild" and "Leave No Trace" hiking. View our trails on Google Earth!